Wow, another CAS card and a bright one at that! 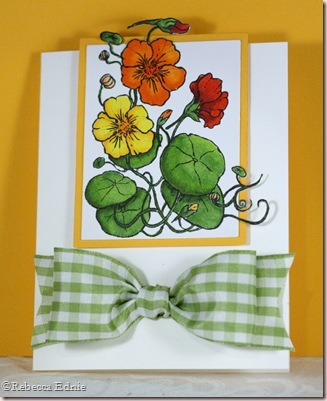 I decided to play Flourishes Timeless Tuesdays Challenge to use flowers. I like to use the company’s stamps for challenges if possible but as I have NO Flourishes Stamps (how is that possible!?!?) I used some images I was given by Bonnie Sharp. I coloured them a long time ago so I am sorry, but I don’t know the colours I used. Once again, I can’t seem to get the colours in my photos right, the green in the ribbon isn’t as dark as the leaves but much more vibrant than it looks. The bow was an interesting discovery. I wanted both tails behind the loops and out to the sides but I couldn’t tie a bow to end up that way to save my life. So I used the method shown in THIS tutorial up to and including step 5. Then I punched two holes in the card, vertically, just under where you want the center of the bow to go. I placed the bow center over the holes and used another piece of ribbon to thread from the top hole over the bow down to the lower hole. Then I used a glue dot to attach the ribbon ends to each other inside the card. I prefer this method to simply tying a ribbon around the bow for the bow middle because it is less bulky because some bulk is inside the card. The size of the holes will depend on the thickness of your ribbon when bunched as does the spacing between the holes. Test ahead of time to determine the sizes to use. Remember that you don’t want the holes too large or you will see them and if the holes are too close together they may rip through. Apparently, you can also get the tails to go to the back with the Bow-Easy if you pull them both up while tightening the knot. I’m not sure it would work with ribbon stiffer than the silk used in the example I saw online but I intend to try it out. Paper: image-UK, white, summer sun CS-SU!